As a trademark lawyer, I pay close attention to brands, logos and piracy. I liked the branding for the Sochi Olympics a lot. Colorful, with a lot of symbols from Russian culture interwoven into the displays and banners in Olympic Park. Do you like this logo for the next major sporting event to be held in Russia? 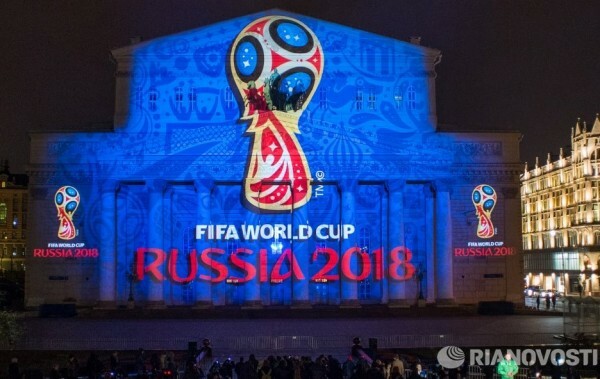 I'm not sure how this FIFA World Cup logo represents Russia? Is it supposed to be a mushroom? Seriously, I don't know the significance of all the elements in the design. Perhaps many people just see this event as another waste of billions of dollars, which could be better allocated elsewhere. In general, I know very little about marketing/branding in Russia, except that intellectual property protection in the country is very, very weak. I've had to deal with this on behalf of several clients who had issues with their famous trademarks being cybersquatted in the .RU domain name space. Basically, it's almost impossible to recover these domains. And the social network VK is a haven for copyright infringement, where almost any film or TV show can be illegally downloaded. Can you believe I've never once illegally downloaded a song or film if it was otherwise available for purchase? It's 100% true. I don't support all these illegal downloads, torrent sites, etc., but most friends disagree with me and continue to dowload creative content for free. You can see here that Russia is at the top of the list for countries with the highest disregard for intellectual property rights. It appears Australia is now considered the nation with the worst piracy levels, at least according to this article. What's your favorite Russian logo or brand? Do you pay for songs on iTunes or some other site, or illegally download music and other creative content for free? Using Google Music, everything which is not in there is torrented. PC games - _first_ downloading it from torrent, if i haven't uninstalled it in 30 minutes - bying on steam. I don't watch TV shows or films at all on my PC. Oh yeah, all of my software is legaly purchaced. Why will you pay for software, but not music? They both can be illegally downloaded. about music - after i bought my first iPod i started to buy music on iTunes. :))! 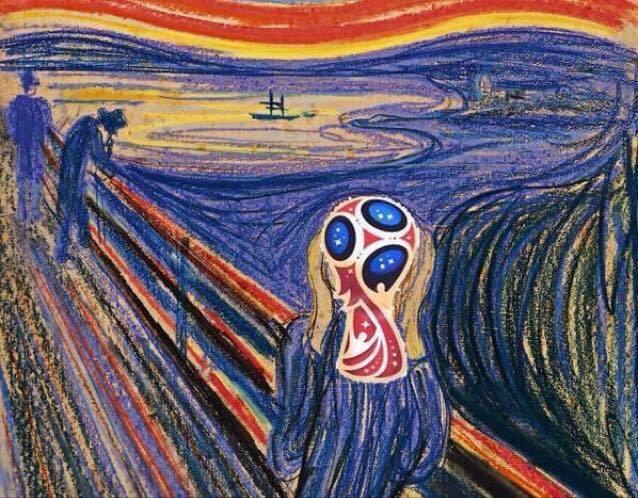 Do you like the World Cup logo? I think people like you and me who pay for music are a rarity. I don't know what it is but this logo looks completely alien. Yes I download everything from torrents and free libraries. But I read or listen or watch not that much of commercial products. They are mostly boring. Even when I download I quickly look and most of the time don't return to them. BTW that article about peaches and coconuts you discussed with Andrey is very interesting. I remember it described in different terms but close: Americans are emotional outside but logical inside. Russians are cold and logical outside but in fact emotional inside. I believe that it is the cause that we don't understand Americans and vice-versa. And I'm proud to that I correctly noticed during my visit that Russians and Germans are close in how we express ourselves. Perhaps the artist took some magic/hallucinogenic Russian mushrooms before creating it? :) The logo is very futuristic and alien-like. So how should artists be awarded for their creativity and contributions to society if everyone is downloading stuff for free? In the music business, almost all earnings now come from concerts and merchandising rather than CDs. I'm not sure how a literary author can make money if people don't buy the books? That article about peaches and coconuts was really insightful and interesting. I think also very accurate. Are IT-bosses poor people? Or West musicians? In ex-USSR many musicians upload their song into internet by themselves. Look at Anton Krotov, all his books are on his site for free, but you also can buy it in paper form. In west culture you pay for everything, but in slavic culture you can lend a book to read or something else. We help each other, and if someone buy a good thing, he share it with friends. So, same story with films or music? why my friend have to buy new film(music, book, wrench, hammer, perforator....) if I have already got it? But logo is really ugly. If a musical artist or author chooses to upload their own music or literary work and offer it to the public for free, then it's a different story. Of course, it's okay to download or view this material. However, do you know how many struggling musicians or artists there are around the world? Or, how long it takes to develop creative content? For instance, one of my travel posts where I'm including a lot of photos and text usually takes at least 6 - 8 hours. If another site publishes this w/out some type of link to my blog, or author credit, it's stealing. I feel the same about all these illegal music downloads, etc. We also share books/films in the West, and as I mentioned in the post, people in America download all this content for free also. It just goes against my personal beliefs. Btw, recently the band U2 automatically downloaded their new album to iPhone users for free, without their consent, as a marketing strategy. Is this okay? Personally, I don't want all this crap on my mobile. That is a matter of price vs value balance. 1. Software. The MS Behemoth upset me so many times when I've used legal software that I would avoid paying them. The biggest trouble was when I had to reformat my HDD right on the Christmas eve and recovering the whole system during two days after. MS support responded that the problem affects a very small group of users, they released a patch 6 month later. It is not what I would expect from "Genuine Advantage". I have other terrible examples from their support as well. They simply out of the real world and ignorant. Pay for ribbon interface? Metro-tiles? They are really laughing in our faces. 2. Media and entertainment. I would buy DVD or music and I do this only when I know for sure that I would like to watch it again over time. Often - after watching a downloaded copy or going to movie theater. But there are a lot of things like movies that I will turn off in 10-15 minutes of watching. Is it fair to pay for that? I do not think so. And there are artists who support this approach. Simple example - NIN, you can download their music officially, even original raw tracks for remixing, or here, in Minneapolis we have a theater that asks for payment after the show and as much as you feel fair, and they do well. I also believe that piracy is fed by greediness of media companies. $14 for CD? Today? Regions on DVD? Locked cell phones? They are loosing more money on that by pushing people torrents and free streaming and equipment hacking. Re: That is a matter of price vs value balance. Sure, I understand your points. The theater in Minneapolis is for current movies? It's an interesting concept, as I've never heard of any theaters doing this in my area. I think it's a good approach. The real media/communications evil is with the main cell phone operators/cable providers. There are not enough choices, and the top three or four have a monopoly over consumers. This always equals subpar service for very high prices. The locked cell phones are a nightmare for me when traveling!! I don't pay for neither music nor movies which i download. There is just no way to obtain music legally in those amounts that i swallow it. Sometimes i even buy some CDs just to soothe my conscience. Because who uses CDs these days anymore? But generally, that current concept of «intellectual property», that is being pushed on by capitalism, is absurd and far fetched. I think. It also explains why this concept is being rejected everywhere. Sometimes the limits are pushed to extreme, I agree. However, if you were an artist that created music, paintings, literary content, etc. I doubt you would want people stealing your content for free. :) Such artists put a lot of time and investment into their creations, and I believe they should be rewarded somehow. Maybe the fact that you like the creation enough to download it (even if you do it for free) is reward enough? Not sure. design logo 2018 World Cup football has developed a branding agency from Lisbon BrandiaCentral. Portuguese company got it right, winning the competition among the eight design companies from Russia and other countries. You can only listen on Spotify free. If you want to download, you must pay. At least last time I checked. I like this service, but nothing beats Pandora. I realise that it's not right not to pay for content at all. But I don't see any alternative to torrents, VK, etc for now. The present copyright laws really try to stop the progress. For example, I can download from torrents the full discography of Metallica - about 360 different editions of albums, singles, etc, 120 Gb in lossless audio. What should I do to get exactly the same legally, and how much it will cost for me? By the way, do people often use torrents in America in general? Is it easy to use them there? For example, in France I download from torrents without any problems in fact. If you want to find some old or rare content, where do you find it? Russian modern art is quite strange. Can you guess what is on the picture? I do download things illegaly and I do watch things illegaly. But at the same time I argue a lot with people here that copyright rights are really the rights to be followed and not to be broken. But it's actually really difficult to explain why you should pay really big money for something you can get for free. Even to myself. to pay 800 rubles for this single book here and to have some really annoying restrictions about the ways I can read it. ( I know because I've allready bought one book from them). to pay 800 rubles for this single book <a href = "http://www.dummies.com/store/product/productCd-1118494180.html"> here </a> and to have some really annoying restrictions about the ways I can read it. ( I know because I've allready bought one book from them). and to be able to copy and paste it to anywhere I want for as many times as I want it. So the bottom line is that I don't see any reason why you should think that you are allowed to read something for free when the author of this book doesn't allow you to do it. And at the same time I see no reason to set a price of 800 rubles for a book when it costs you nothing to produce another copy of it. So it's kind of mixed thoughts for me about this issue. Why do you like the FedEx logo? I think it's quite boring, although the color elements are eye catching and distinctive. А) There is not a even single example when the Internet deprived musician or writer of ability to create. Discussions about this are hypocritical fiction of merchants, obvious that the trade suffers, not creativity. Б) There are many examples when the free circulation of information in the Internet has helped talented people to become famous and rich. В) Movie companies have to accept the fact that the main profit they get by renting movies in theaters and by selling rights to cable TV companies. The luxury to sell the same movie to the same person first on VHS, then on DVD, after on Blu-Ray is a thing of the past. Yes, I'm very sweet and innocent. :)) But, not on the topic of intellectual property. I know the subject, because it's the filed of law in which I practice. I did not say that the Internet deprives or discourages artist creativity. My stance on the subject is that artists deserve to earn a living from their creative efforts. If people put videos, music, etc. on YouTube for free, then great. It's their choice, and they obviously are trying to make people aware of their talents and grow a larger audience. You will recall this is how the most annoying and now richest pop star, Justin Biber, was discovered. Musical artists have now accepted the reality of the situation, and earn almost no money for new music releases. They know most people take the music for free. So, they just gouge people by raising the price for concert tickets and merchandising. So, the consumer is screwed one way or another. I'm far from being a footbal fan, so all this fuss about World Cup 2018 annoys me beyond all measures. Another useless waste of money, when the country hasn't yet recovered from the Olympic games. My only hope is, that since my city is in the list for some games within the Cup, they will do something to the roads here. "Another useless waste of money"
These events and promises that were given publicly kick the asses of government officials that they improve the country's infrastructure. New roads, new hotels, new resorts, new stadiums.